Cousins playing like best buddies despite a year since their last visit together. Today when I got home from work Jillian said, "Mom, I missed you for 100 years!" My $1 investment that bought 15 glow bracelets for the Fourth of July. You gotta love the dollar section at Target. 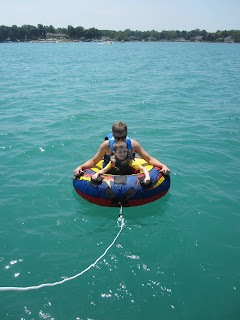 It was so much fun for the kids - big and small. Both Myles and Jillian are still playing with them (even though they don't glow anymore). In fact, despite getting home LATE on the 4th Jillian distributed 12 bracelets around her room. It was a glowing disco bedroom for the night. My new braided pizza recipe. It was super easy, the kids loved it, Jillian called it a pizza ponytail, and yes - that is garlic butter brushed onto the crust. Can you get any better? I doubt it. 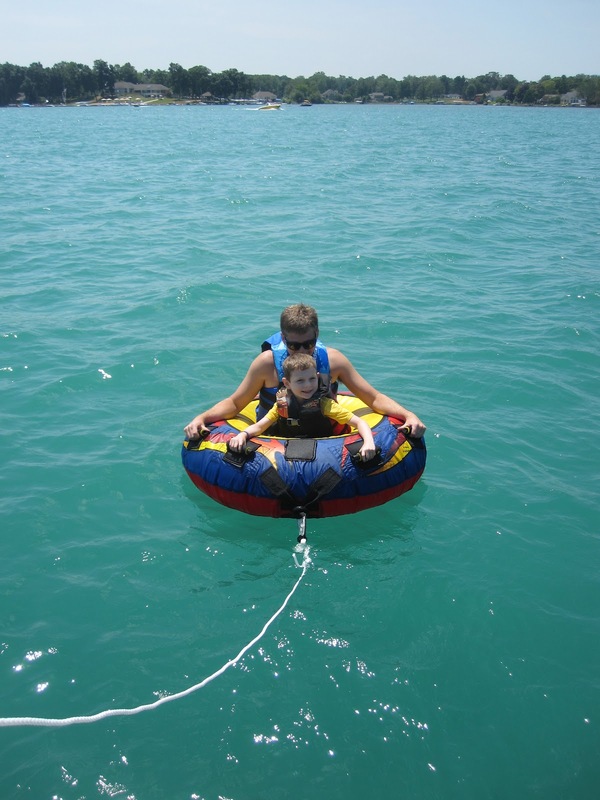 Myles was brave enough this week to try tubing on the boat. It ended not so amazing - since he got a face full of water and shed a few tears. I'm just so glad he had the courage to try. Hopefully it won't take years to try again. Walking in the Richland Parade for Ben's AAA office. It was so much fun handing out bags and seeing all of the kids so excited at the parade. Having sweet ballplayers helping hand out candy made it even better! This picture. Look at Jillian's pouty face. Even funnier, as soon as she was asked to be in the picture, her attitude and smile changed immediately. This second photo was taken literally 10 seconds later. Having double booked meetings...on a Monday...on opposite ends of the building...wearing a pencil skirt and four inch heels. I probably didn't need to run last night. Back and forth. All. Day. Long. Ripping my nail off putting away a big binder at work. It even bled! I do look pretty awesome with my Cinderella bandaid, though. I've been adding push-ups and backwards push-ups (you know when you look like a crab crawling - I have no idea what these are really called) to my workouts lately. Last night I flexed for Ben. He laughed.